For the CBC on December 11, 2016. Until recently, homeopathic remedies sold in the United States enjoyed many of the same privileges — including the freedom to claim they could treat or cure specific ailments or diseases — as real, science-based medicine. The difference? Peddlers of homeopathy weren’t required to provide the Food and Drug Administration (FDA) with any evidence whatsoever to substantiate the miraculous therapeutic claims their products made. The same has largely been the case in Canada. Its underpinning theory is that “like cures like.” Homeopathic drugs are made using trace elements of substances that cause symptoms in healthy people. Those elements are then diluted entirely out of existence, priced at a premium and sold as inert “remedies.” Infinite dilutions of poison ivy would be sold as the treatment for a persistent itch or chronic rash, for instance. The idea is that water carries a “memory” of substances it has come into contact with — a theory that defies the basic principles of biology, physics, and chemistry. To find a single molecule of active substance in a 30C homeopathic solution (the dilution level of many over-the-counter homeopathic treatments), for instance, American physicist Robert L. Park notes you’d require a container of water greater than 30,000,000,000 times the size of the Earth. No amount of evidence will be sufficient to sway those hopelessly indoctrinated into pseudoscience, but many who turn to alternative medicine are driven by honest misunderstanding of how the body functions and how medicine works. Some are also driven by the appeal to nature — a seductive fallacy which argues that “natural” is inherently good, therapeutic, and pure — based on the notion that homeopathy is a natural choice. That’s likely too esoteric for the average consumer, but clear labels indicating a lack of scientific backing surely is not. Canada, however, has only gone so far as to require labels for nosode products (which are touted as vaccines) and homeopathic remedies for cough, cold and flu marketed to children 12 and under. Everything else can stand on pharmacy shelves, right next to legitimate medicine, and sold as fanciful medicinal alternatives. Fortunately, Health Canada has just recently signalled that it’s ready to start cracking down on claims that have not be scientifically proven. This isn’t complicated. Holding practitioners of alternative medicine — and the products they sell — to the same rigorous standards we apply to physicians, pharmacists and all other certified healthcare professionals is certainly not asking too much. If the U.S. can do it, why can’t we? David and Collet Stephan are on trial for failing to provide the necessaries of life — for failing to seek medical care for their son in a reasonably prudent time/manner. They are NOT on trial for murder or manslaughter. Ezekiel Stephan died from bacterial meningitis, the kind which is vaccine-preventable and when promptly and properly treated, can be fully recovered from. The bacterial meningitis was at such an advanced state by the time Ezekiel finally reached hospital, he was clinically brain dead and sepsis was coursing through his bloodstream; the post-mortem revealed pus on his brain, in his spinal fluid, and on his right lung. These facts are 100% knowable, and known, and irrefutable. People lie, autopsies and medical reports do not. The child’s health deteriorated for weeks: he was displaying neurological abnormalities (likely small seizures) and was neither eating nor drinking, but sustained through an eyedropper, as the parents stuck to the “game plan” they’d drafted to “use as many natural things” as possible before resorting to proper medical intervention. As Ezekiel lay dying in hospital, his parents were defending the efficacy of their plan. Asked by the officer whether he considered himself an expert in naturopathic remedies, Stephan said no. Ezekiel was regularly given vitamin and mineral supplements, said his father, who is a vice-president of Truehope Nutritional Support Inc., a natural remedies company founded by his father, Anthony Stephan. The mother told the officer she immediately started giving Ezekiel natural antibiotics and anti-inflammatories, along with a product called Total Reload, “which is filled with electrolytes, vitamins … and amino acids that are already a broke-down form of protein,” she said. Total Reload is one of several natural supplement products sold by Truehope Nutritional Support Inc.
That “improvement” included his body being visibly contorted and too stiff to sit in his car seat when they sought out the Naturopath and purchased an Echinacea mixture to administer to the child. No longer arching his back, and soon, no longer breathing. The Stephans called 911 twice — with a 23 minute gap in-between. For a full 23 minutes after Ezekiel first exhibited signs of respiratory distress – the father counted 5- and 6-second gaps between breaths – the Stephans opted to ‘wait and see’ as Ezekiel struggled to breathe for nearly a half-hour. Ezekiel did not die from lack of oxygen, nor was his brain affected by time in Ambulance without a properly fitting face-mask. The child was being worked on by paramedics the entire time. Brain death from oxygen is markedly different from brain death from meningitis, and both the CT scan in hospital and autopsy conformed there were NO signs of brain damage or death from oxygen deprivation. Dr. Adeagbo concluded that Ezekiel died from both bacterial meningitis as well as pneumonia with an accompanying empyema. Empyema is typically diagnosed in the setting of a bacterial pneumonia when pus collects within the lining of the lung. So what does this mean? It certainly makes sense from a clinical perspective. Ezekiel likely developed bacterial pneumonia caused by infection by either S. pneumo or HiB, which went untreated and developed into an empyema. At this point surgical drainage is usually necessary for recovery in addition to appropriate antibiotic treatment. His bloodstream was repeatedly showered with the pathogenic bacteria, which eventually made its way to the child’s brain. This new information adds to my suspicion that Ezekiel was much more ill-appearing than described by his parents and the nurse who visited the family’s home. Although there may have been some degree of waxing and waning of his symptoms, particularly with the fever he almost certainly developed during the course of his illness, I am very skeptical of claims that he had any significant recovery just prior to his arrest. This also makes it more likely that he suffered a great deal prior to his death. Those who’ve been following this case will be familiar with the aggressive misinformation campaign mounted by the Stephans and their apologists/supporters. Karen Selick, who I’ve touched on before. She has a long history of working along side a man named Shawn Buckley — president of the Natural Health Products Protection Association (NHPPA – an alt-med/health lobby) and defence lawyer for David and Collet Stephan. He previously represented Truehope/Anthony Stephan in the fight with Health Canada. Buckley was supposed to be at a recent Total Health Show in Toronto, but couldn’t attend due to the trial. Selick was there, though, and distributing photocopies of her (now pulled) op-ed for the Lethbridge Herald (a nearly identical version still appears on Huffington Post Canada) where she lies about my column for the National Post and about the case itself. Danielle Smith had Selick on her radio program to repeat a number of untruths about the case, completely unchallenged. Smith later hosted a man named Ian Stewart to present the “other side” of the story. Stewart is Vice-President of the NHPPA and Director of Regulatory Affairs for Truehope. He is also the one behind the Stephan’s Stand 4 Truth blog where he offers a skewed interpretation of events from the trial. Massive massive system shaking scandal coming out in court tomorrow as Albertas Recently retired Chief Medical Examiner testifies AGAINST the crowns star witness and the Provinicial Government specifically regarding this case!!!!!!!!!! Massive cover up!!!!!! Her qualifications and credentials have come under scrutiny before. She is not board-certified or trained in forensic pathology, nor does she have license to practice medicine in Alberta. She did not, at any point, examine the child and her nonsensical testimony and blatant misreading of the autopsy would have medical professionals calling for her to be stripped of her medical license — but she doesn’t have one. There’s much, much more to write about the many players involved in this case, the multitude of conspiracy theories they’ve concocted regarding the trial and the case itself, and the trail of lies from all involved which, thanks to testimony from medical professionals and recorded police interviews, have been exposed as such. For now, however, just be aware of what you’re being sold when you’re presented with other versions of this tragic story, and by whom. Legitimizing Pseudoscience: What’s The Harm? This column ran in The National Post on March 24, 2016. After weeks of trying “natural” extracts and homemade remedies like smoothies cut with ginger root and horseradish to cure a suspected case of meningitis, 19-month-old Ezekiel Stephan’s tiny body had so deteriorated that he was too stiff to bend. Unable to be sit in his car seat, Ezekiel’s parents, David and Collet, loaded a mattress into the back of their vehicle to take him to a health practitioner — not a doctor. Now on trial for Ezekiel’s death, the Stephans pleaded not guilty to the charge of failing to provide the necessities of life, maintaining they’d pursued a legitimate, alternative course of treatment. And for those immersed in the pseudoscientific realm of “alternative health care,” this, indeed, seems to be a perfectly reasonable defence. The same government that is now prosecuting the Stephans has also granted the College of Naturopathic Doctors of Alberta (CNDA) the power to self-govern their industry — in essence, the state is now prosecuting parents for pursuing cures from a modern-day snake-oil industry that it licenses and legitimizes. The profound suffering and preventable death of Ezekiel has rightly provoked heated discussion about the validity of so-called alternative medicine, prompting finger-pointing toward all who enabled and abetted the long deterioration and ultimate death of a toddler whose ailment was both vaccine-preventable and entirely treatable. One thing is clear: Ezekiel is a casualty of pseudoscience; his death facilitated by the allure of alternative medicine. Naturopathy, for instance, is not a form of medicine, but a system of belief; its approach to treating illness reliant on the theory of vitalism. That is, disease is viewed as being caused by an imbalance of vital forces and, thus, the treatment rests in the restoration of those forces. Despite its claims to ancient roots, naturopathy was invented by Benedict Lust, a German immigrant to the United States and self-proclaimed “doctor” who was ultimately convicted for practising medicine without a licence. To this day, many procedures on its standard list of practices and cures have not passed scientific muster. Naturopathy relies on dubious diagnostics — hair analysis and IgG Food Intolerance screening, for instance — to identify non-existent deficiencies or fabricated ailments. The prescribed interventions, conveniently, are on hand and sold directly by practitioners. Treatments range from the proven-ineffective and largely innocuous, such as Vitamin C infusions and herbal supplements, to the far more dangerous and potentially fatal ozone and chelation therapies. Naturopathy preys on the critically and terminally ill by peddling false hope and sham treatments with exorbitant financial and emotional costs; it fuels scientific illiteracy by accommodating those who misunderstand or distrust legitimate medicine, prescribing futile detox and cleanse regimens. Naturopaths endanger public health by agitating against vaccination, selling homeopathic nosodes, which, to be clear, are entirely inert. As Timothy Caulfield, professor in the Faculty of Law and the School of Public Health at the University of Alberta wrote in 2013: “There is no evidence that homeopathy works, and given the absurd nature of the proposed mechanism of action, no scientifically plausible reason that it should work.” None. Although homeopathy was not prescribed in Ezekiel’s case, it remains one of the central tenets of naturopathy. And when governments capitulate to the demands of a pseudoscientific lobby, as Alberta did in 2012, such nonsense is granted authority. Though undoubtedly lucrative, embracing and incorporating magical thinking into the realm of evidence-based medicine is both ethically questionable and professionally irresponsible. If naturopaths, homeopaths, osteopaths or any of the numerous “natural” or “holistic” practitioners want to be regarded as heath-care professionals and afforded the same respect, opportunities and privileges earned by those working in the evidence-based medical system, they must agree to be held to the same standards in terms of education, certification and efficacy of their prescribed treatment. Until the alternative health industry is required to demonstrate the validity of its existence, the corpses that refute it will continue to mount. And all who overtly or indirectly enable the spread of pseudoscience share the blame for the casualties. 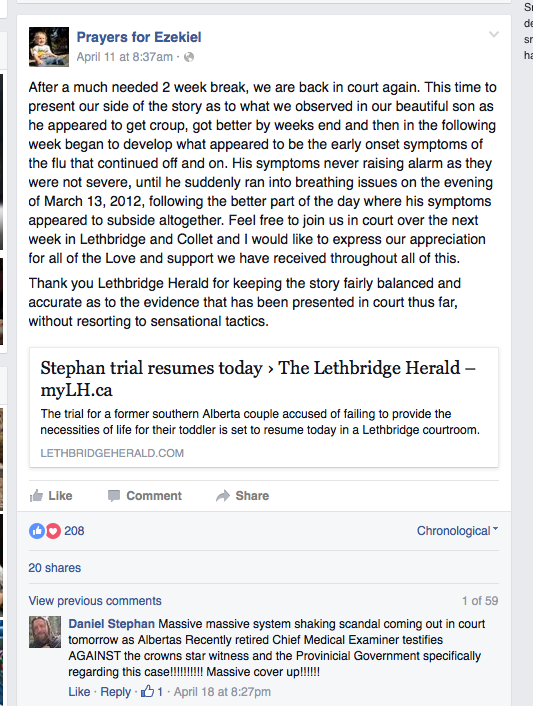 On April 2, the Lethbridge Herald published an incredibly irresponsible and non-factual response to my column written by Karen Selick, a woman who is involved with the alternative / naturopathic (and conspiracy-minded) industry, and who has received financial contributions from Naturopaths for her raw milk lobbying efforts. She has also appeared at numerous naturopathic/alt-med conferences and events. The National Post recently published an opinion piece that exemplifies how moral panics get started. If by “moral panic” Selick means “necessary scrutiny of an industry which, at this moment, claims (among other things) that cancer has an “emotional cause” and is cured by proven-ineffective (and expensive) ‘alternative’ methods,” then OK.
Alheli Picazo’s March 24 article, entitled “Alberta Shares the Blame” (the online version was called “When naturopathy kills”), dealt with a criminal prosecution currently before a jury in Lethbridge. David and Collet Stephan have been charged with failing to provide the necessaries of life to their son Ezekiel, who died in 2012 of meningitis. Correct. Also: I do not write the headlines. So far, only the prosecution has called witnesses. The case stands adjourned until April 11, when the defence will begin. But Picazo has already rushed to judgment. Yes. Ezekiel’s death was 100% preventable, and yes, as he did not receive the vaccination to prevent the form of meningitis he died from, nor did he receive legitimate medical care before it was too late to allow him to be treated for, and recover from, said meningitis (due entirely to his parents’ extreme anti-vax stance and belief – and personal business – in “holistic” remedies) he was a casualty of pseudoscience. HERE and HERE are just a pair of examples of the father’s anti-vax musings. HERE and HERE from the mother. Those parents must be monsters, right? Actually, no. What’s monstrous is the number of factual distortions that Picazo packed into a single paragraph, with not even an “alleged” kicking around to hint that there might be another side to the story. There is no ‘other side’ to a ‘story’ here. Ezekiel’s “suspected meningitis” did not go on for weeks. He had started exhibiting symptoms of a cold, or at worst croup, around Feb. 27, 2012. Over the next two weeks, his symptoms disappeared and returned twice, sometimes appearing like flu, but never including seizures or rash. Actually, yes. The meningitis did go on for weeks. In February, when Ezekiel first started showing signs of illness, his parents thought it was a croup. And it was a steady deterioration from that point – from the bacterial meningitis – until his death. Further, “never including seizures or rash” is meaningless. It was not until March 12 that a family friend – a nurse who coincidentally knew that there had been a recent case of meningitis in her hospital – mentioned the possibility of viral meningitis. But based on Ezekiel’s mostly asymptomatic condition that day, she said, he’d probably be turned away from a hospital emergency room. No, that’s not what the nurse-friend said. She told the parents to take Ezekiel to see a doctor. Those were not the nurse-friend’s words. Picazo makes it sound as though Ezekiel was getting progressively stiffer over a period of weeks until he was loaded rigor-mortis-like into the car to visit a naturopath. Yes, that’s because he was. Those are the facts, and entirely knowable based on the autopsy. Here is a thorough read of this from one who knows. In fact, on the morning of March 13, he had been in his car seat, perfectly able to bend. No, that’s not a fact. It’s a flat-out lie, actually. The parents’ own statements to RCMP (played in court) refute Selick’s assertion. But he was cranky and uncomfortable, so rather than aggravate his distress, they removed him from the car seat and let him lie on his foam crib mattress on the back seat. “Crib mattress”. That’s cute. No, it was not a crib in any way. It was just a mattress and the parents never attempted to present it as anything but. When a crisis arose that evening – Ezekiel temporarily stopped breathing – his parents called 911 and set out for the hospital. Picazo says, “Only after their son stopped breathing did the Stephans think it wise to call 911.” But wait – 911 is for emergencies. People who call 911 because their kid has a cold can be fined up to $10,000 in Alberta for making a frivolous call. Yes, 911 is for emergencies — as in a deathly-ill child. Can Selick point to any case where a person suspecting their child needed medical attention (even if it were a simple cold or flu) called 911 and was subsequently fined/charged? The unfortunate truth that Picazo omits is that meningitis is an illness that can strike suddenly and kill within a day or two. Usually, the symptoms progress very quickly from bad to worse. Ezekiel’s waxing and waning cold symptoms are not typical, and might indeed have indicated nothing other than a cold at that time. There was no omission. I have a word count to adhere to. I’d love to have gone into great detail about the illness itself. Also: the “Ezekiel’s waxing and waning cold symptoms” line is, again, intentionally misleading. Ezekiel’s symptoms were not mere cold symptoms, and the extent to which they fluctuated is in doubt. The Meningitis Research Foundation of Canada’s website contains dozens of stories of meningitis cases that killed or seriously disabled their victims within days. In numerous cases, doctors had examined the victims not long before and sent them home with diagnoses of cold, flu, food poisoning, ear infection, gastroenteritis, pneumonia, etc. And here Selick reveals her true motivations. She is an activist against the Canadian medical system, and is a documented agitator against ‘socialized health care.’ She regularly pulls the “but doctors make mistakes too! Hospitals kill too!” line to distract from scrutiny of the alt-med industry — one to which she belongs and believes in religiously. The only definitive way of diagnosing bacterial meningitis is a spinal tap in which fluid is drawn from the spinal cord and tested. This excruciatingly painful procedure exposes patients to additional risks. Doctors do not ordinarily inflict it upon patients who appear to have merely colds or flu. Yes, a spinal tap is a necessary diagnostic procedure, because that’s how real medicine works. And no, it’s not “excruciatingly painful.” It’s uncomfortable yes (I’ve had a few) and gross to think about if you’ve never had one, but nothing more. And again: Ezekiel was not simply ill with – or exhibiting mere signs of – cold or flu. Further, that fear of a spinal tap was one reason the parents avoided the hospital. So far at the trial, none of the prosecution’s doctors has claimed that they could have definitively diagnosed meningitis from the symptoms Ezekiel exhibited at the time. None has claimed that Ezekiel could definitely have been saved, even if he had received aggressive treatment. Not true at all. They could not speak definitively on a child they had not seen, but it was testified and is knowable what the outcome would have been for a child in the exact same circumstance as Ezekiel if properly treated. Picazo says the Alberta government shares the blame for Ezekiel’s death because it licences naturopathy. However, she fails to mention that the ambulance that met the Stephans on their drive to hospital had been stripped of some equipment by that same Alberta government approximately a year before. Consequently, it had no air mask small enough to treat Ezekiel en route to hospital. He spent eight and a half minutes in the ambulance without air. A later CT scan showed brain injury consistent with lack of oxygen. No, actually. That’s another lie from Selick. The CT confirmed that lack of oxygen was NOT to blame. A week after Ezekiel’s death, infant air masks re-appeared in ambulances. I can’t help wondering whether the Alberta government is prosecuting these parents to divert attention from its own possible liability. Gee, that sounds familiar.. Quite familiar, in fact. Karen Selick is a lawyer and writer based in rural eastern Ontario. During her cold symptoms last week, she did not suspect meningitis and did not rush to the hospital demanding a spinal tap. Another attempt to confuse cold/flu symptoms with advanced bacterial meningitis. Also, even if Selick had meningitis and rushed to hospital demanding a spinal tap, only a doctor can decide whether one is warranted. And only a doctor can order one. Ugh Canadian health care, amirite?! I’ll leave it for you to judge the merits of Selick’s piece, and the wisdom of the Lethbridge Herald in running it. On April 14, the Lethbridge Herald ran my response. parents are currently on trial. Selick accused me of “factual distortions,” yet failed to specify a single one. Why? Because there were no inaccuracies to identify. All the information in my column was accurate — and verifiably so — unlike the numerous false claims Selick resorted to in the effort to rebut my piece. Selick also asserted “on the morning of March 13, (Ezekiel) had been in his car seat, perfectly able to bend.” This, too, is not true. According to the parents’ own statements to RCMP — which were played in court — Ezekiel’s body was so stiff from illness that he could not sit in his car seat, which is why he was placed on a mattress (and not a specially-made “crib mattress” as Selick portrayed it as — just a small mattress) in the back of the family vehicle. finally, albeit it far too late, called upon. While it’s true the ambulance lacked a properly-fitting mask for Ezekiel, Selick’s claim of brain-death from lack of oxygen is yet another falsehood. What the CT scan confirmed was that lack of oxygen was not to blame for the child’s death. As medical examiner Dr. Bamidele Adeagbo testified, Ezekiel was brain dead when EMS met up with Stephans. Adeagbo explained what differentiates a brain deprived of oxygen from one suffering meningitis, and concluded there were no signs Ezekiel’s brain died from lack of oxygen. Ezekiel, he confirmed, was dead before EMS intervened. Why did Selick feel the need to respond to something I wrote in a publication other than the National Post, the paper which ran my column? I would hope it’s because, like any responsible news outlet, Selick’s submission would be seen as questionable due to the misrepresentations of the case and additional inaccuracies to the ones detailed above. Readers should also know that Selick is an adherent to, and an affiliate of, the alternative/natural health industry and has appeared at numerous naturopathic/alt-med conferences and events. She is a long-time agitator against the Canadian health-care system, and played a prominent role in pushing the Shona Holmes story and scaring Americans into believing health-care reform was not in their best interest. Selick seems to believe there’s a government conspiracy to keep treatments and cures from the public so that the pharmaceutical industry can profit off disease, and she is a full-fledged anti-vaxxer who believes vaccines cause autism. to be presented. Selick’s misrepresentation of the case was a dangerous effort to grant legitimacy to a modern-day snake-oil industry — one in which she has a personal stake. As I argued in my initial column, people who view the world as Selick does, when reading such nonsense as Selick wrote, are led to believe that there is an alternative to evidence-based medicine. in a certain Lethbridge courtroom. More facts about this case and further information on Selick’s connections to the Stephan family and her role in their co-ordinated misinformation campaign can be found HERE. This op-ed appeared in The Ottawa Citizen on February 10, 2015. There’s an illness sweeping its way across North America, one which has long-troubled the scientific community and baffled even the most seasoned medical expert. This problem isn’t new, but was once considered primarily a threat to underdeveloped nations which have yet to fully reap the benefits of modern medical and technological advances: advances which turned once-fatal conditions into manageable, even curable, ones; advances which have saved countless lives and alleviated immeasurable suffering. The regression, this outbreak of a highly-contagious, yet preventable, affliction, is what so troubles the medical and scientific communities alike: the ailment poses a direct risk to past public-health achievements. Though, when caught early, the condition can be treated and rectified, this particular malady is notoriously impenetrable once full-blown. In mild cases, the afflicted are referred to as merely “vaccine-hesitant”: often new parents, genuinely interested in the health and welfare of their child, yet lacking the specific knowledge required to fully understand the importance of vaccination. Given their openness to discussion, early-intervention is key to full recovery. The combination therapy of patience and availability is often the best approach; A steady dose of evidence-based material is prescribed, and in most cases, the science-denialism will simply run its course. Full-blown anti-vaccination sentiment, however, is one of science-denialism’s most potent manifestations. Not only is it highly contagious through typical transmission channels — fringe pseudoscientific websites; conspiratorial Facebook memes — but once airborne, this virulent ideology is nearly impossible to contain. Television and radio tend to be the incurably-afflicted’s host of choice. Knowing media are under great pressure to avoid the appearance of bias, the stricken demand equal airtime, insist on presenting “the other side” of the argument. Of course, there are no “two sides” in the matter of vaccinations; no “debate” to be had. There are proven, irrefutable facts regarding the safety and efficacy of vaccination, and there are lies. It’s that simple. Those beyond treatment, whose science-denialism hardens in the face of evidence, have, ironically, shown a developed immunity to facts. They aren’t driven by reason, but rather, by motivated reasoning — seeking only information fitting their beliefs, and when presented with details challenging those preconceived notions, they double-down on denial. Though there isn’t a cure for science-denialism, there are steps which can be taken to mitigate the risk, keep the contagion in check. By refusing to give the infected a platform, be it through on-air interviews or quoting at length in print, media can prevent misinformation from benefitting the appearance of validity. Yes, every person is entitled to an opinion, but no, every opinion does not warrant equal merit. Medical professionals and the science-minded can work to counter the pseudoscience by making themselves available to help the under-informed navigate the information minefield; providing resources to debunk anti-vaccine assertions; answering even the silliest question without judgement. We must accept, too, that not every mind can be changed. But it’s always worth the shot. It’s a service that has benefitted Calgarians for two decades, backed by peer reviewed research and conclusive scientific data demonstrating the undeniable role it plays in the field of preventive medicine. Raise a glass to Community Water Fluoridation (CWF), that is, while you still can. Because Monday, City Council will vote on Ald. Druh Farrell’s regressive motion to scrap Calgary’s water fluoridation program. Armed with unsubstantiated claims and assertions gleaned from sources such as the discredited Fluoride Action Network, (or perhaps from the uninformed and poorly researched editorial in the Calgary Herald), Farrell and other luddites on city council are on the verge of rescinding an effective program based entirely on conspiracy theories and misinformation. Claim: It’s not cost effective / other sources of fluoride do a better job at protecting teeth. Claim: The overall downward trend in cavity rates is due factors such as better oral hygiene, not water fluoridation / It doesn’t benefit adults. Fact: Children living in communities with water fluoridation experience an 18% cavity reduction compared to those in communities without access to fluoridated water. Adolescents and adults in communities with fluoridated water experience an average of 25.6% and 20-40% respectively, than their counterparts living in communities without access to fluoridated water. Claim: Studies show the risks of fluoridation outweigh the benefits / there is growing credible research demonstrating the dangers of ingesting fluoride. The merits of water fluoridation are unmatched and undeniable. Endorsed by Medical and Dental Associations worldwide, CWF is considered an investment in the future health and overall wellbeing of a given population. This counteracts recent claims from Tea Party/Libertarians that CWF somehow deprives them of their choice to consume un-fluoridated water; that it violates their ‘personal freedoms‘. Unlike the disadvantaged who have neither the money for, nor the access to, expensive dental procedures, those demanding ‘freedom’ and ‘choice’ are the very ones who have the opportunity to exercise it. If Calgarians are unsatisfied by the water provided by the city, they can opt to invest in a water filtration system, or chose to consume bottled water. It really is that simple. Mayor Naheed Nenshi, a fellow fan of scientific research and hard evidence, has expressed his desire for input from the scientific community, medical experts, and the general public, regarding the future of Calgary’s water fluoridation program. It’s my hope that the medical, dental, and scientific communities heed the Mayor’s call for expert, informed opinion. Whether City Council votes to end Calgary’s fluoridation program or not, it’s important that votes are based on accurate information and conclusive evidence. Three months ago, Calgarians opted for progress and advancement when they elected Nenshi as mayor. Let’s hope the 14 Aldermen chosen to represent the will of the people will continue to do just that, and keep the much beneficial water fluoridation program.